U.S. President Barack Obama tells American Jewish leaders his Israel visit is not meant to resolve a "specific policy issue." U.S. President Barack Obama on Thursday signaled there would be no big Middle East peace initiative on the table when he arrives in Israel later this month for his first visit as president, AFP reports. Obama met American Jewish community leaders at the White House as he prepares for the trip, which he said was not aimed at resolving a "specific policy issue," a U.S. official said, according to AFP. "The President reiterated America's unshakeable support for Israel and thanked the leaders for role they play in strengthening ties between the two nations," the official said of Thursday’s meeting. "The President noted that the trip is not dedicated to resolving a specific policy issue, but is rather an opportunity to consult with the Israeli government about a broad range of issues -- including Iran, Syria, the situation in the region, and the peace process," added the official. "He also underscored that the trip is an opportunity for him to speak directly to the Israeli people about the history, interests, and values that we share." The White House did not immediately provide a list of Jewish community leaders who took part in the meeting, which was not on the president's public schedule. One participant, however, Marc Stanley who chairs the National Jewish Democratic Council concurred that the president said he would discuss Iran, the peace process and Syria on his trip. "President Obama is a true friend (of) our community and said that he looks forward to a dialogue with the Israeli people," Stanley said, according to AFP. 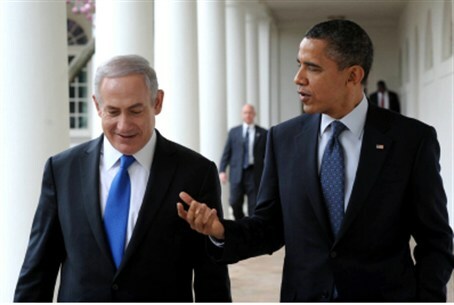 The White House had clarified last month that Obama’s visit to Israel is not meant at presenting a new proposal for peace talks with the PA.
White House spokesman Jay Carney told reporters that the timing of the visit is intended to coincide with the beginning of the second terms in office of both Obama and Prime Minister Binyamin Netanyahu. Nevertheless, an unconfirmed report this week said Obama has demanded a timetable for an Israeli withdrawal from Judea and Samaria. The report, which quoted anonymous "Israeli sources," said Obama wants Netanyahu to present him with a detailed Israeli withdrawal plan during his visit to Israel. The sources said the Israeli plan "would be considered in what could be an imminent U.S. initiative to establish a Palestinian state in the West Bank in 2014."